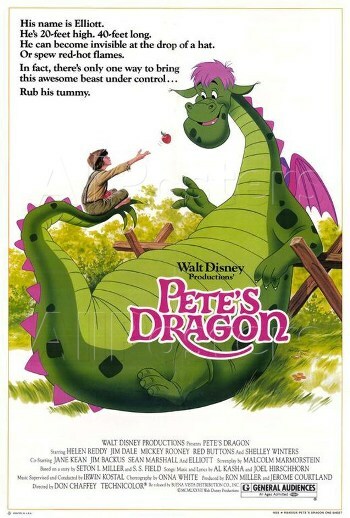 Pete's Dragon, a 1977 Disney film, is another Spiritual Successor to Mary Poppins, though not as direct a successor as Bedknobs and Broomsticks was. It's a live-action musical that uses cel animation to bring its title character to life. It stars Sean Marshall as Pete, Helen Reddy as Nora, Mickey Rooney as Lampie, Jim Dale as Doc Terminus, with Red Buttons as his sidekick Hoagy, and Jim Backus as the mayor of Passamaquoddy. It is the early 20th century, and Heartwarming Orphan Pete is on the run from the cruel Gogans, a backwoods family that bought him to be their slave. He has but one friend - Elliot, a friendly dragon. Elliot doesn't speak English, but he can fly, breathe fire, and turn himself invisible; most of all, he's got Pete's back. Together they arrive in the town of Passamaquoddy, Maine. No one here believes in dragons, of course, and because Elliot's usually invisible, his faithfully following Pete around causes a lot of problems for the kid - which are sometimes exacerbated when Elliot tries to protect him from unjust punishment. Still, Pete is taken in by Nora, a lighthouse keeper's daughter (her dad, Lampie, is the one person in town who has seen Elliot, but no one believes him because he's the town drunk), and Elliot hides out in a nearby cave. Pete soon bonds with Nora and Lampie, and even tells Elliot about Nora's lost-at-sea fiance in hopes the dragon can find him. Alas, Snake Oil Salesman Doctor Terminus, played by Jim Dale, arrives in town and learns from his lackey Hoagy (whom Lampie takes to the cave to prove his claim) about Elliot. The parts of a dragon supposedly can be compounded into all kinds of medicines, so Terminus seeks to capture Elliot. Then the Gogans arrive, and the two evil parties meet and combine their forces. It all comes to a head on a stormy night that will be rife with rescues. Award-Bait Song: "Candle on the Water", one of the earliest examples of the trope. Lost to "You Light Up My Life''. Berserk Button: The Gogans to Elliot, especially if they threaten Pete. In fact, anyone who threatens or even so much as kicks Pete is his Berserk Button. Big Bad Duumvirate: Ma Gogan and Dr. Terminus have vastly different goals, but are still able to cooperate. Big "NO! ": Hoagy does this when Dr. Terminus told him to get the dragon. Bullying a Dragon: Literally. At the end, when everyone can see Elliot, the Gogans actually try to intimidate him using legalese. He responds by incinerating their bill of sale. But Now I Must Go/Bittersweet Ending: Elliot leaves Pete at the end specifically because another kid needs his help and Pete now has a family. It's his M.O. ; he shows up when a kid needs him, and when they don't need him anymore, he moves on to the next one. Cassandra Truth: Pete trying to tell his teacher that "It was Elliot!" who was doing all the crazy shenanigans that she was blaming and punishing him for. Chekhov's Skill: Many dragons breathe fire, of course, but Elliot's ability turns out to be the one thing that can relight the lighthouse lamp in the climax. Cigar Chomper: The mayor, and a Running Gag involves his cigar getting broken in two. Corrupt Hick: The Gogan family . Covered in Mud: The Gogan family, knocked into a giant mud pit by Elliot. Crowd Song: "I Saw a Dragon". Crunchtastic: The big Ear Worm song, "Brazzle Dazzle Day"; in fact, the movie's Tag Line was "Brazzle Dazzle Brilliance!" Dastardly Whiplash: Dr. Terminus, more or less. Deadpan Snarker: Again Dr. Terminus, usually when dealing with Hoagy. Dunce Cap: Pete gets one when he gets in trouble with his teacher on his first day of school for things that Elliot did. Of course, Elliot blows it off when he gets enraged enough. Easy Amnesia: It turns out Nora's fiance Paul was in a shipwreck and suffered amnesia. When he returns to her at the end, he says he regained his memory when he fell out of a bed - an "accident" which was obviously Elliot's doing. The Family for the Whole Family: The Gogan clan. Doc: "The existence of a dragon would have an impact of gigantic proportions. Mythology and legend would become history and science. [to himself] One would make a quick buck with it." Gentle Giant: Elliot. Just don't threaten Pete. Get Out! : When Hoagy turns down the big chance to seize the opportunity, Dr. Terminus gives a loud one of these to Hoagy. Happily Adopted: Pete by the end. Hard-to-Light Fire: The climactic scene has Elliot trying to light up the lighthouse's lamp with his flame breath... and it is the only moment on the whole film when he has a hard time using said ability. Could be justified in that his body is shown to be really crammed and twisted into that little lighthouse staircase, and he's having trouble drawing in enough breath to really cut loose. Heartwarming Orphan: Pete is remarkably angst-free and pretty easy to love. Honest John's Dealership: Doc Terminus's travelling medicine show with assistance from Hoagy, who is planted in the crowd as a shill. Impact Silhouette: An invisible Elliot leaves a dragon-shaped hole in the school wall. Ink-Suit Actor: Elliot's expressions are identical to Charlie Callas. Instant Awesome: Just Add Dragons! : Elliot. It Makes Sense in Context: Dr. Terminus's "Landship," a sailboat on wheels. It Must Be Mine! : Terminus wanting to capture Elliot. It Is Pronounced "Tro-PAY": Terminus keeps getting the town's name wrong. Hoagy would correct him. Karma Houdini: What comeuppance does the Gogan clan get for everything they've done? Aside from a lot of public humiliation, not much. The only "punishment" they got, if you can call it that, is going through all this trouble to get Pete back and having to go home empty-handed. And the brothers will have to "pick up the slack" on the chores now that they don't have Pete anymore to do most (if not all) of the work. Even that seems doubtful, since according to their verses in the opening song, they were going to kill him anyway. Large Ham: Most of the cast, especially the villains. List Song: "Passamaquoddy," Doc Terminus's cheerful recitation of the New England towns he's visited and illnesses he's cured ... a recitation that comes to a stammering halt when he tries to pronounce his current stop. Also, "Every Little Piece" has Terminus and Hoagy talking excitedly about many parts of a dragon's anatomy and how they could be used on fanciful remedies (and thus how they intend to gut Elliot into absolutely nothing and make a buck out of it). Mainlining the Monster: Doctor Terminus wants to get his hands on Elliot (the titular dragon) to be made into medicines. Mama Bear: Nora. She constantly interrupts the Gogan's second Villain Song with threats toward them if they even think of hurting Pete. Medicine Show: Doc Terminus brings one into town. It's all a lot of quack cures. Medium Blending: Live-action and animation. Mobile Kiosk: Doctor Terminus' "Landship". Musical Chores: "Brazzle Dazzle Day". Never Trust a Hair Tonic: When Dr. Terminus comes to town, the townspeople confront him about his various medicines that didn't work the last time he was there, including one man whose hair turned from gray to pink thanks to the doctor. No Celebrities Were Harmed: Elliot's physical appearance and mannerisms were based on the actor Wallace Beery. No Sympathy: When an invisible Elliot begins playing with the school bell while Pete is in class, Pete runs out to stop him; he is followed by the teacher who then accuses Pete of ringing the bell — despite the fact that Pete was sitting in the front row of the classroom when the bell began ringing. This is pretty much the teacher picking up the Idiot Ball in order to press Elliot's Berserk Button. Obfuscating Disability: Hoagy uses this to give Doctor Terminus and his tonics some ill-deserved credibility. First he plays an old and obviously deaf woman, and fakes gaining the ability to hear. Then he masquerades as a old man who hobbles on crutches and doesn't need them anymore once he's had some of Terminus's tonic. Painting the Medium: Closed captions (in the VHS-version anyway) had Elliot's dialogue, or at least mentions of his grunts, in green-colored font. Papa Wolf: Elliot to Pete. Plot-Driven Breakdown: The climactic storm extinguishes the lighthouse's lamp just as a ship - carrying Nora's fiance, among others - is approaching, risking a wreck. Nora and Lampie can't relight it, so it's left to Elliot to do the job with his fire breath. He does, and in the process, Nora sees him for the first time. In that same scene, it also applies to Elliot's fire-breathing ability, in that he's wedged so tightly into the lighthouse's stairwell that he can't inhale. Re-Cut: The original 128-minute version was cut several times, doing stuff like changing "Candle In The Water" into a music-only version, removing "The Happiest Home On These Hills" (and trimming down "We Got A Bill Of Sale") and taking out some other scenes. Red Eyes, Take Warning: Elliot, after hearing Hoagy's message that the Gogans got Pete. Rousing Speech: "Hoagy. We are all on this Earth for a purpose, and the time for your purpose is now. I know that inside this pale, frail, pathetic shell of a man... there is a Vesuvius ready to erupt. Now, I've known you, man and beast, since, since you were nothing. But now, Hoagy, now, you're still nothing, but you could be something! You can be a somebody. A legend, Hoagy. A legend in your own lifetime, not a joke! The moment's here, Hoagy. Grab it. Grab it! Today the jester. Tomorrow the king!" Rule of Three: The mayor's cigar breaks in two. Dr. Terminus' inability to correctly pronounce "Passamaquoddy". The Shill: Hoagy, who disguises himself as people who pretend to be cured by Doc Terminus's miracle tonics. Shut Up, Hannibal! : Nora does this repeatedly during the Gogan's second Villain Song; unfortunately, they won't shut up, requiring Elliot to deliver a far-more unsubtle one that capsizes their boat. He delivers a much more threatening one in the climax, incinerating their bill of sale when they try to threaten him with it, sending them fleeing out of town. Snake Oil Salesman: Dr. Terminus sells bogus cures and tonics. Stock Scream: Dr. Terminus lets out a Goofy holler. That Reminds Me of a Song: There are ten songs and four reprises. Most of them do serve the story; others, such as "I Saw A Dragon" or "Brazzle Dazzle Day", are about rather banal things. There Is Another: The reason Elliot must leave Pete is to help another kid. They Would Cut You Up: What Dr. Terminus wants to do to Elliot. The Unintelligible: Elliot, who communicates with grunts, clicks and scatting, leaving Pete to translate for him when needed. Villain Song: "The Happiest Home in These Hills" and "We Got a Bill of Sale Right Here" for the Gogans, and "Passamaquoddy" and "Every Little Piece" for Dr. Terminus and Hoagy. Villain Team-Up: The Gogans team up with Dr. Terminus and Hoagy. Teacher: No no no, this is irregular, irregular, irregular! Nora: But he needs an education, education, education. Visible Invisibility: Elliot, by way of him leaving footprints, dragon-shaped holes in walls, etc. Would Hurt a Child: The Gogans, who sing about torturing and killing Pete in the beginning of the movie. They're probably not serious about the killing part at least, since they want him to work their farm. You Gotta Have Pink Hair: One of Terminus' toxins gave a person pink hair. Elliot also has pink hair. Which makes him an invisible pink-haired dragon.